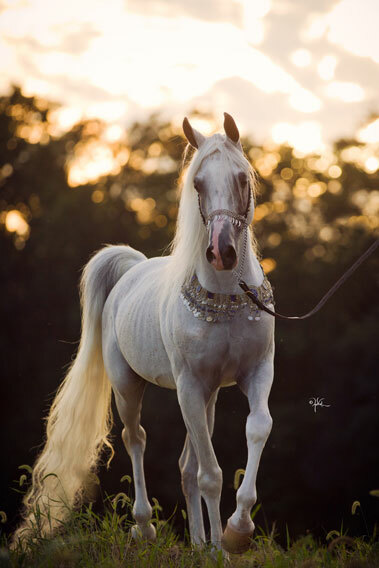 Imperial Baaru is everything a Straight Egyptian is breed to be; he combines an ethereal beauty, athleticism and versatility all in one very exotic package. To top it all off, he constantly produces it. 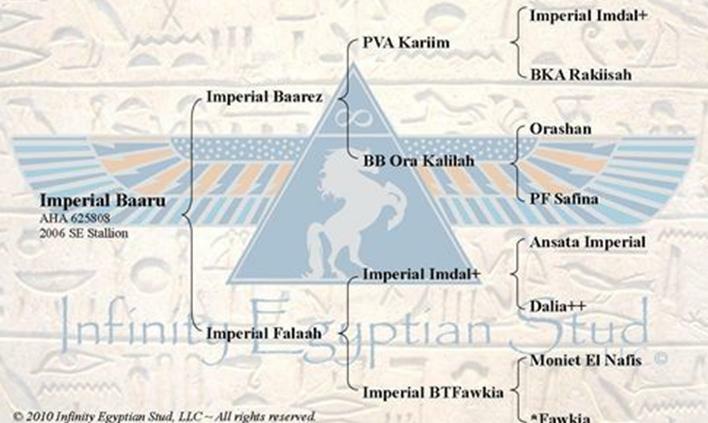 Baaru is one of the last breeding sons of Imperial Baarez, bred by Imperial Egyptian Stud, still in the United States. Standing at an impressive 15.2 hands, he posses European type with a long stretchy neck, nicely laid back shoulder, a great topline, long hip, excellent croup, powerful hind quarters, a nicely chiseled head and to top it all off- he is loaded with charisma!! Baaru’s movement is equally impressive as his exotic beauty. He is a trotting machine with extreme power and suspension. Imperial Baaru is just as impressive in the breeding shed as he is passing all of his excellent qualities onto his offspring. 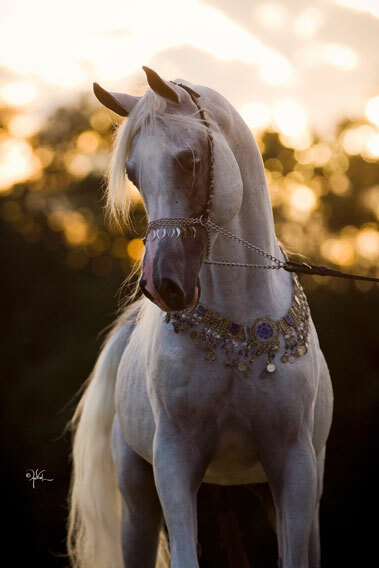 Straight Egyptian stallion, Imperial Baaru, is one of the few breeding stallions sired by Imperial Baarez left in the United States. 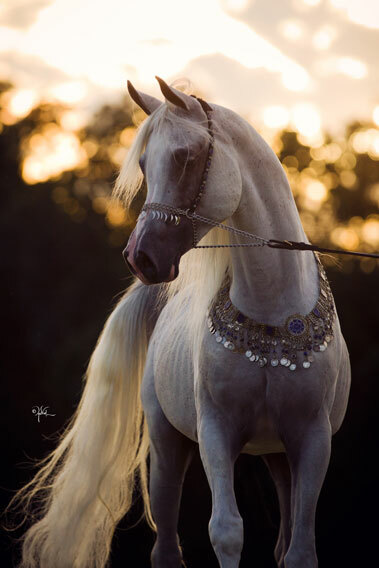 Imperial Baaru is sired by Imperial Baarez (now exported) who is a US Egyptian Event Supreme Champion stallion and Reserve World Champion stallion. He was also a US Nationals Top Ten futurity colt, and showed successfully in Hunter pleasure Jr horse, Dressage Training Level, and Country English Pleasure Jr horse. Not only a successful show horse himself, but Baarez is also a sire of international champions with his get and grand get winning top honors. 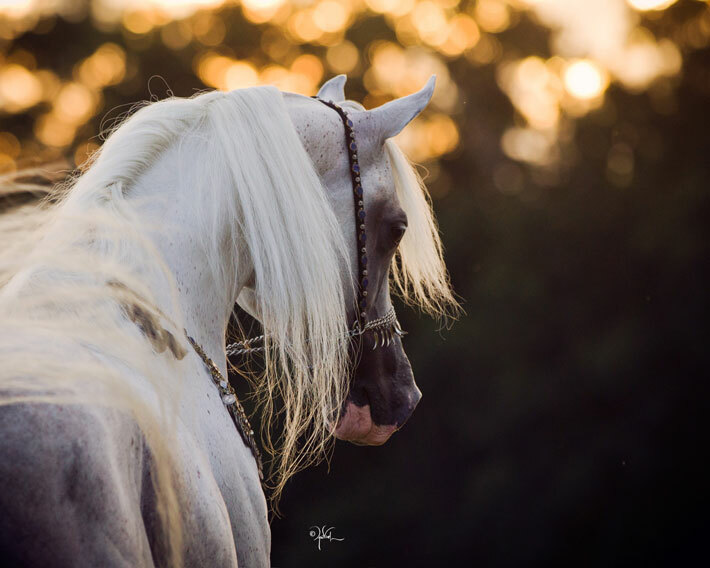 Imperial Baarez is sired by PVA Kariim and his dam is sired by Orashan, who is an Egyptian Event Supreme Champion stallion, US Nationals Top Ten in halter, Canadian Nationals Top Ten in halter and Country English pleasure and was successful in pleasure driving and show hack as well. Imperial Baaru is a maternal half brother to a stallion who sired the 2011 US Egyptian Event EBC Champion filly (and top three EBC filly), 2012 Futurity Champion yearling colt, 2012 Top Six EBC filly, 2013 Top Five EBC filly, 2013 Reserve Futurity Champion yearling filly and other Egyptian Event Top ten wins.